RIO DE JANEIRO, BRAZIL – The ‘Tupy or Not To Be: Teatro, Cinema e Novas Mídias’ (Tupi or Not To Be: Theatre, Film and New Media) multimedia project began at Caixa Cultural in Rio de Janeiro on Thursday, January 15th and will continue through Sunday, January 25th. Featuring performances by São Paulo theater group Boa Companhia (Good Company) and screenings of the documentary “Corumbiara” by Vicente Carelli, the initiative aims to bring attention to past and present indigenous issues in Brazil. São Paulo theater group, Boa Companhia (Good Company) will present “Cartas do Paraíso” (Letters From Paradise) as part of the multimedia project, photo by Vitor Damiani/press image. 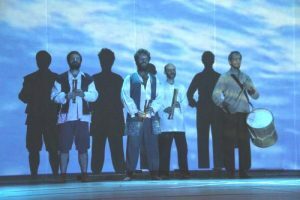 During the project, Boa Companhia, known for previously staging and adapting the works of Shakespeare, Samuel Beckett, Kafka and Nelson Rodrigues, among others, will present the film “Cartas do Paraíso” (Letters From Paradise). Directed by Verônica Fabrini, the piece is a dramaturgy of exploration. It examines a fictional landing of Jesuit priests, explorers, and settlers to the Pindorama area, a region named by the native Tupi people of Brazil before the arrival of the Portuguese in the country. “We seek to build scenarios from bibliographies, iconographies, and sound research, but we do not aim to present a historical reconstruction,” Fabrini told Agência Brasil. Also part of the project, the screenings of French-Brazilian filmmaker and anthropologist, Vicente Carelli’s documentary, “Corumbiará”, will take place at 4PM on both January 23rd and 24th. Released in 2009, the film addresses the 1985 massacre of indigenous people on the Corumbiará farmland located in the southern part of the Brazilian state Rondônia. Corumbiará was also a later site for massive struggles between landowners and peasants in the region. The state of Rondônia has been documented as a heavily deforested Amazon area in the country. When: January 15th-25th. Performances are scheduled for 7PM, Thursday through Sunday. “Corumbiará” will be screened on January 23rd and 24th at 4PM.